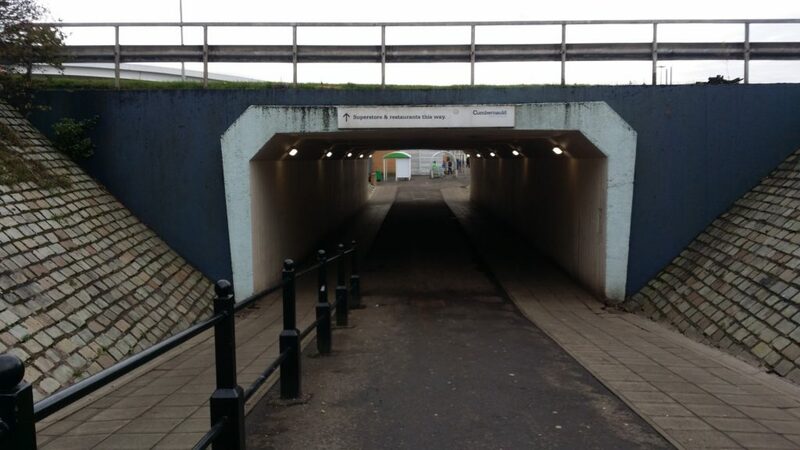 …but today I went to Cumbernauld instead. 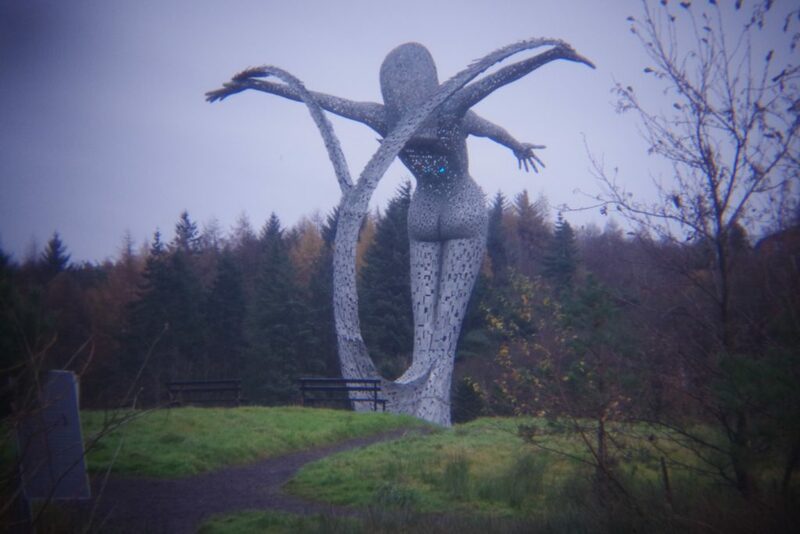 It’s fair to say that Cumbernauld does not rank among Scotland’s most beautiful places. A New Town of the fifties, it’s largely made of concrete and is widely considered a classic example of how not to plan a town. I like a bit of brutalism, though, so I went there. As you do. 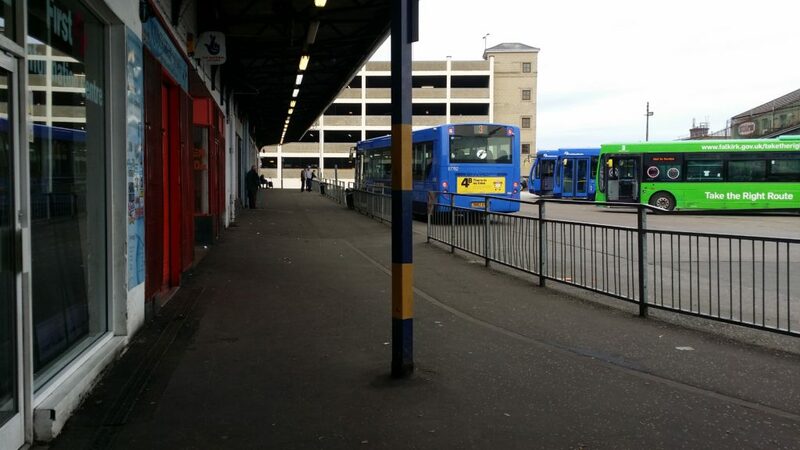 I took the bus, which required a change at Falkirk Bus Station. I’m sure that if you investigated this, you’d find that Falkirk Bus Station saps peoples’ will to live faster than just about any location on Earth. Even on a sunny bright day it’s pretty grim, and in the middle of November in the cold it looked bloody awful. There were a handful of people about, all of whom looked like they’d seen far better days, and quite a few of them smelt pretty awful from quite a distance. It’s no wonder that bus travel is seen as a crisis purchase and that people don’t use buses if they can possibly help it. This is a truly horrible place to spend any time in, it really is. Bleak, cold, gloomy and with terrible amenities, it’s hard to see how it could possibly be much worse. There’s occasional talk of refurbishing it, but it never happens. I got onto the X37 to Cumbernauld with a motley crew of smelly people, and carefully avoided the seat with beer spilled on it. Classy! When I arrived, I intended to take lots of pictures, but I only took a few in the end. The bus lulls you into a false sense of security by passing through the quite attractive Cumbernauld Village first, before dumping you in the concrete horror that is the town centre itself. Leaving the bus at street level, you end up inside a building full of brown tiles, that eventually takes you via some corridors to a covered shopping mall – apparently the first in the country. It’s obviously been refurbished and looks alright, but many of the shops were empty, and most of the rest were vape shops, pound shops, Greggs, Argos etc. I eventually found my way out and headed towards some of the restaurants I’d seen on my way in to town. This was quite tricky – like many a new town, getting around on foot is confusing and frustrating because you can’t walk next to the roads – but eventually I got to Pizza Hut. There was hardly anyone in there, which is always good – I’m bit of an introvert and consider restaurants more than about 10% full to be unbearably crowded. I settled upon a starter, pizza, drink and salad, and enjoyed the comically bad service. There were about four staff present, but clearly only one of them was actually working. The rest stood around talking and ignoring the customers, and their poor overworked colleague. She struggled valiantly while the others ignored her, and the food was alright. Let’s just say it’s just as well I wasn’t in a hurry. I made sure I tipped the poor frazzled woman before I left. I hope her lazy colleagues didn’t get to the money first. I then set off on a brisk walk. I have a new fitness tracker with GPS, so I tried it out, and got it to record where I went. I walked about five kilometres, over to Croy, and here’s a typical Cumbernauld view. It was a nice idea to try and keep pedestrians and cars apart, but it never worked very well. Look how uninviting that is! It’s even worse at night. It makes providing bus services within the town really tricky as well. Anyway, thankfully I made it to the other side without getting mugged by junkies or anything. 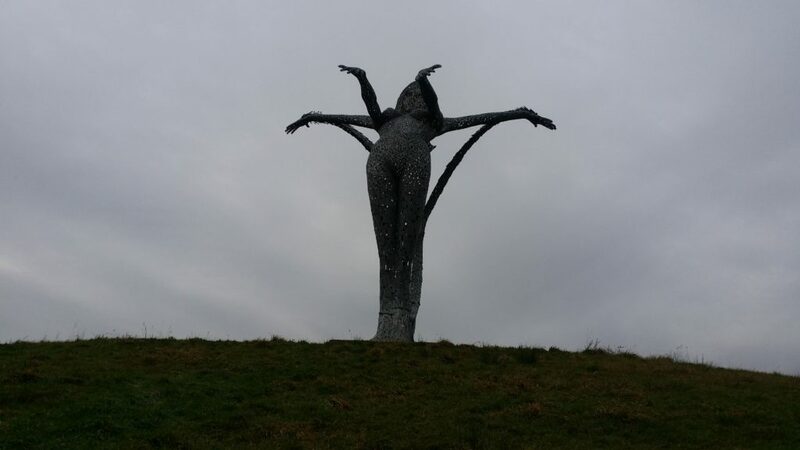 I was actually soon in a very pleasant and uncrowded green space, heading over the motorway to a rather attractive sculpture I’ve driven past lots of times but never seen up close. 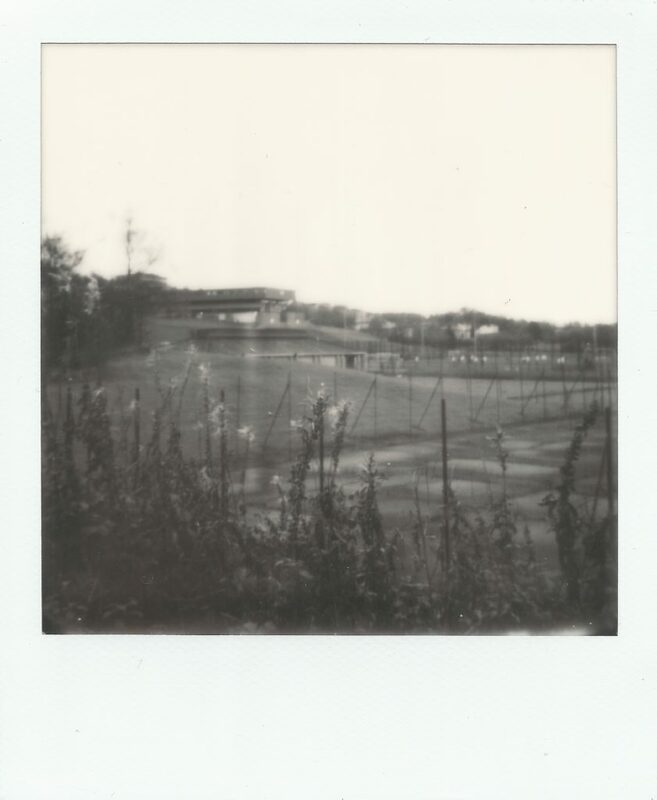 I wanted to try out the new black and white film in my Polaroid, in the hope it produces better results than the colour, and here’s my first attempt – Cumbernauld in all its gloomy glory. I rather like this, it’s nicer than the colour and less inconsistent and streaky. It has a rather more vintage look to it than the Instax black and white I’ve just shot. 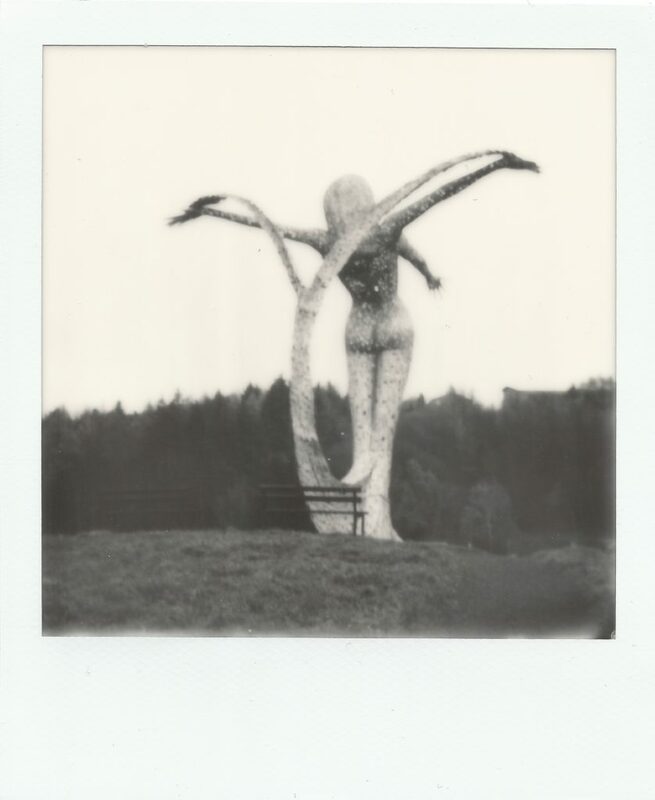 Anyway, here’s my next Polaroid, shot at Arria, the statue overlooking the town from the Croy side of the motorway. As pieces of public art go, it was rather spectacular. Busy too, lots of people were walking by, and it’s also right next to cemetery full of people tending to the graves. I think towns need more things like this, especially a town like Cumbernauld which is afflicted with more or less permanent gloom. It lights up in various colours at night. This side of the motorway is officially Croy rather than Cumbernauld, and it consists mainly of houses that look just like Privet Drive in Little Whinging. I wandered through them until I got to Croy station and then headed home by train. I’m probably not selling it much here, but it was an interesting exploration of a place that has some merit, despite being spectacularly ugly. I probably sound like I’m just slagging it off, but I actually had a lot of fun! Honest! I did over 17,000 steps today, and as I’m very keen to get more active, that has to be a good thing. It’s worth mentioning, of course, that Cumbernauld is the location for “Gregory’s Girl”, which has to be one of Scotland’s greatest cultural exports. If you haven’t seen this wonderful film about teenage awkwardness, starring John Gordon-Sinclair and Claire Grogan, you’re really missing out. Oh, and my wife’s grandmother is in it too! She’s the woman with the lawnmower in the background, when a bunch of the main characters are talking. Yup…my in-laws got together in Cumbernauld, so it’s a part of my family story. And a few bits of it are nice.